What are some healthy kid treats for summer? School’s almost out, the weather’s heating up, and your kids are craving those icy treats. Since a diet of ice cream and milkshakes isn’t what the dentist ordered, here are some suggestions for frozen delights that are less sugary and more nourishing. Thread grapes onto wooden skewers, then freeze in a gallon freezer bag. Thaw ten minutes before enjoying. Kids love to help thread the grapes onto the skewers and the end result tastes like a sweet slushy. Blend bananas, yogurt, raspberries and vanilla until smooth. Spoon into a muffin tin (silicone works best) and top with blueberries and raspberries. Freeze, then pop out and store in freezer bags. Thaw ten minutes before enjoying. These charming, sweet-tart cups are perfect with breakfast on a hot morning. Puree fruit in a food processor until smooth, then stir in seeds. Spoon mixture into pop molds and freeze. 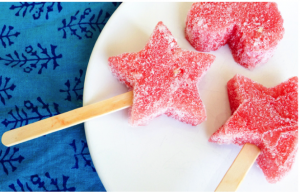 These sweet speckled pops provide extra soluble fiber and a fun crunchy/smooth texture. Probiotic powder is optional in this creamy vegan ice cream. 1 Tbls. natural peanut butter. Puree banana chunks in a food processor until creamy. Add remaining ingredients and puree a second time, until the consistency is completely smooth, like soft serve. Enjoy immediately. In a food processor or high-powered blender, puree all ingredients until smooth. Pour into pop molds and freeze overnight. Put some orange veggies into your sweet treat! They add fiber, vitamin A and depth-of-flavor. Fresh watermelon, whole or part. Cut the watermelon into large rounds about ½ to 1 inch thick. Use the cookie cutter to punch out shapes, and insert one stick into the middle of each shape. Stack carefully inside a gallon freezer bag and freeze overnight. ← If Food Was Cleaning Products, Which Would You Use to Do Spring Cleaning? If Food Was Cleaning Products, Which Would You Use to Do Spring Cleaning? How often should I get dental x-rays? How do I get my child to eat a healthy lunch at school? How do I choose a toothpaste?